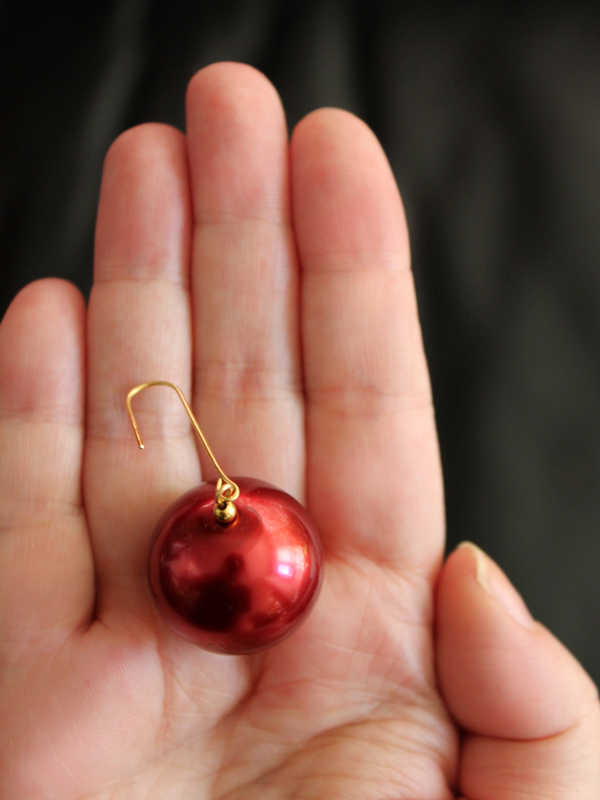 Here's an idea for people interested in making ornaments to decorate a small Christmas tree. 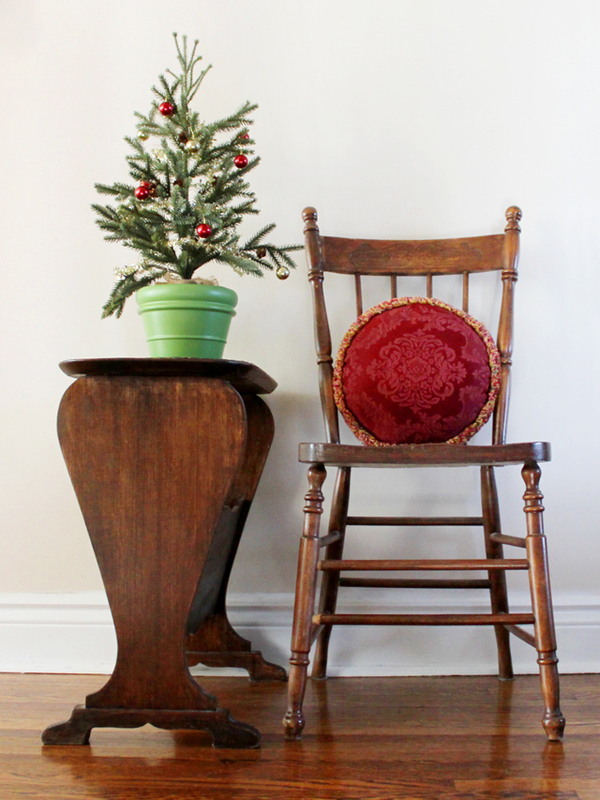 Personally, I love little trees and have a few of them, some vintage and some newer. 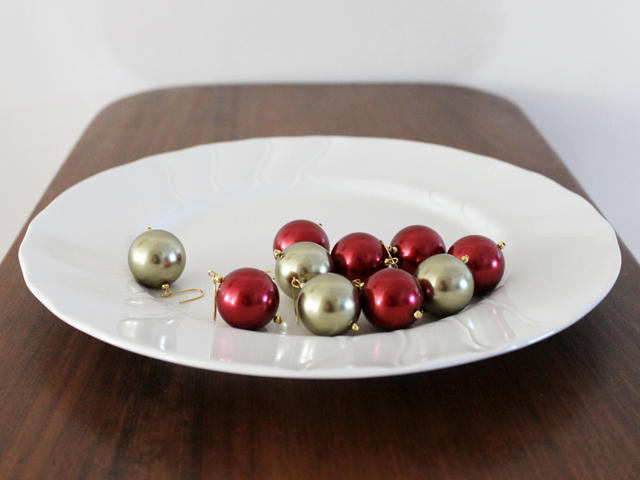 Most years, I forego a big tree and set these out on tabletops and cabinets. They make excellent accent lamps, gently casting light in dark corners when strung with either electric or battery powered twinkle-lights. 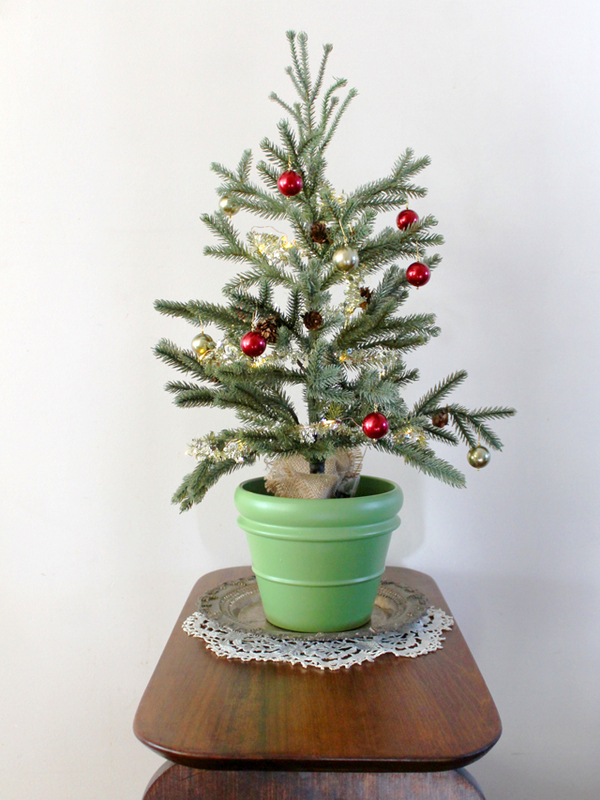 However, one thing about tiny trees is that it hasn't been all that easy to find attractive small-scale ornaments to decorate them with. Several years ago, I found some lovely vintage glass ones on ebay, but see that, nowadays, small ornaments are in high demand and get multiple bids, going for high prices. And the small newly manufactured ones I've been able to find in the shops, haven't been very pretty and are often cheaply made out of plastic. 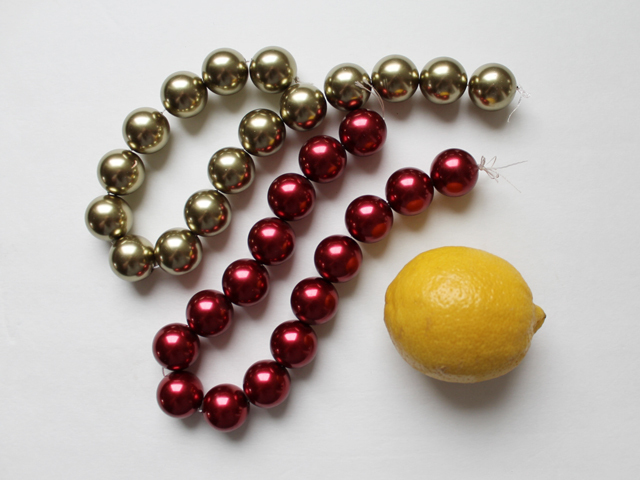 Not being near Queen Street shouldn't stop you from making some of these small baubles though, as these large pearl beads, often called "Gumball Pearls" are easy to find online. I saw several vendors on Etsy who carry them -- here is an example. To give you a sense of cost for this DIY, the strings of 16 x 24mm beads was $5.99 each and the headpins and beads were about $2. 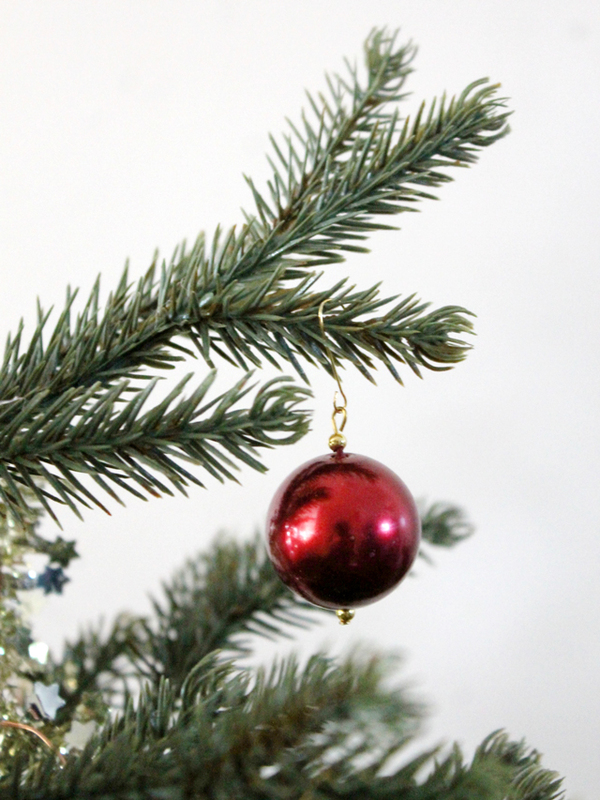 One string of beads would easily have made enough ornaments to decorate a small tree, but I couldn't chose just one colour, so went with two stings, and have some beads left over. 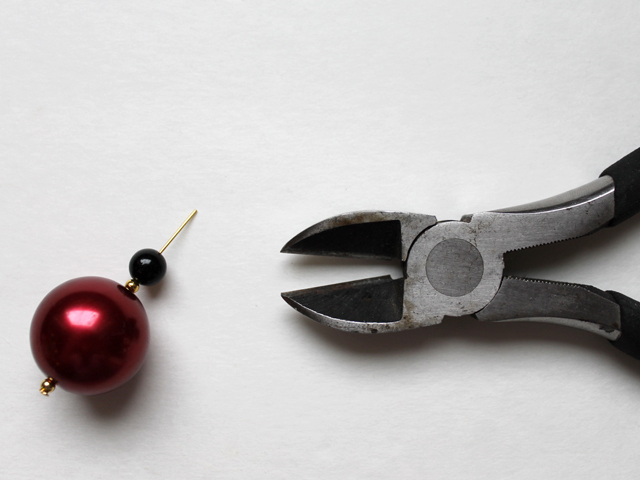 As for the jewellery making tools, you probably have all that you need in your household tool box, except for the round-nose pliers that help make round loops in wire. You could use regular needle-nose pliers to make your loops though, as long as you weren't particular about having them perfectly rounded. If you would like to get some round-nose ones, you can get them for $7 to $10 at any shop that sells beading supplies ... my mini ones go for $7 at Michaels but I had a 50% off coupon so got them for $3.50. I've used them a lot this past year and they work well. 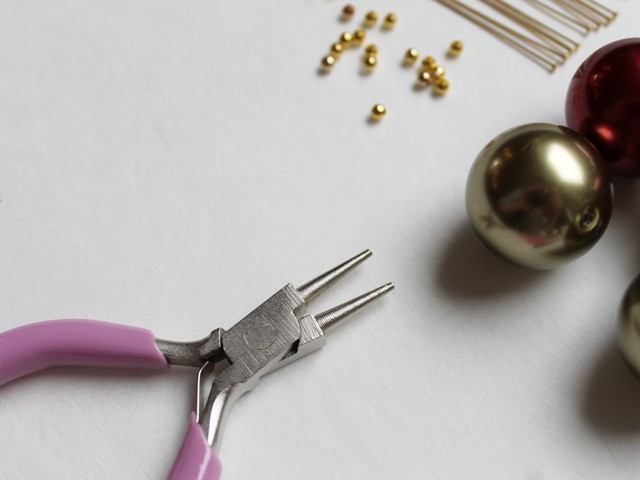 - headpins (found where jewellery making supplies are sold) in either gold or silver tone. 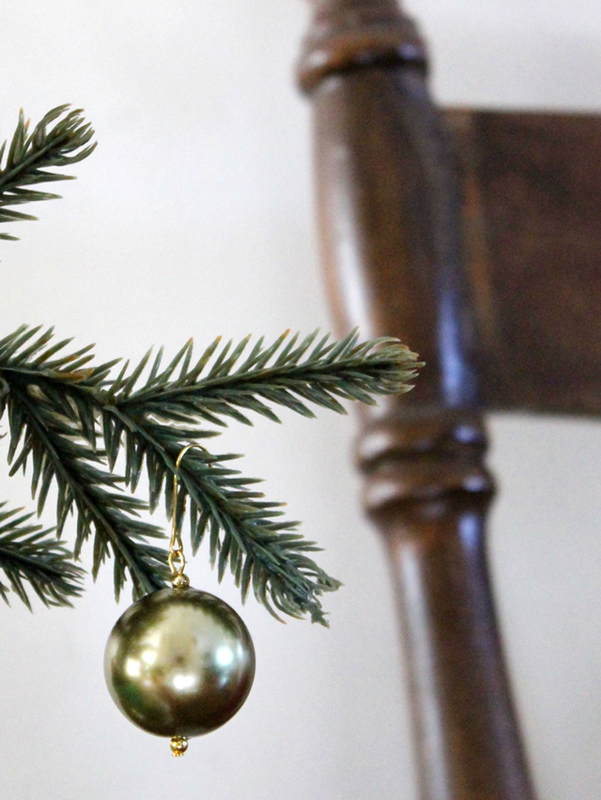 You need 2 for each ornament. 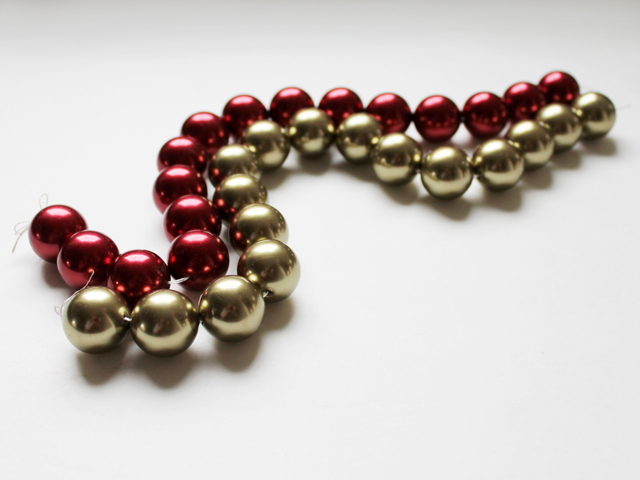 - small beads in whatever finish / tone you'd like, 2 for each ornament. 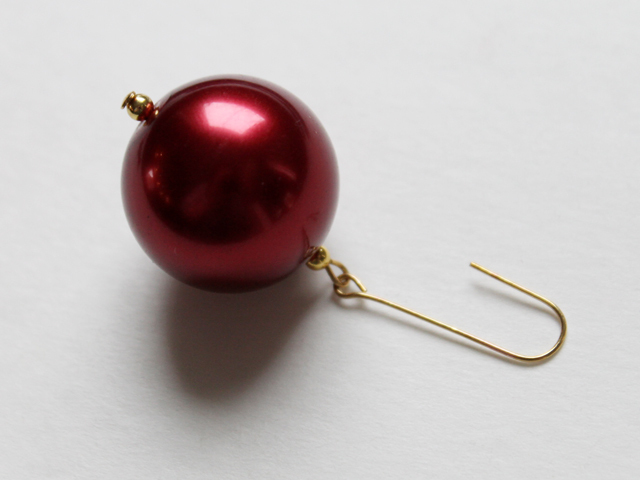 (these are needed to keep the headpin from going right through the hole in the bead, but if you find pins with heads that are large enough not to slip through the beads, you can skip the beads if you want). 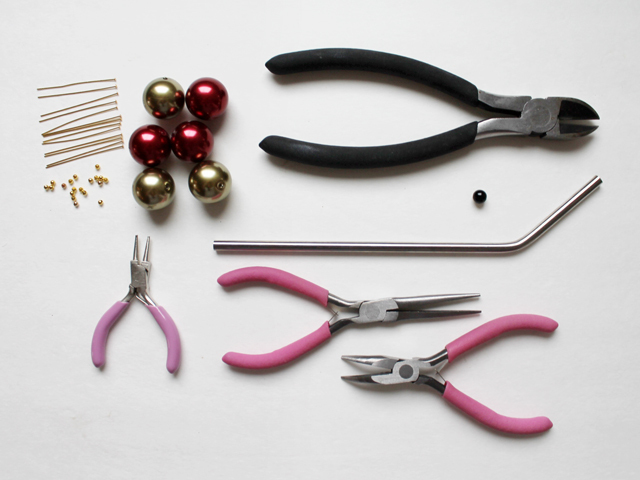 - wire cutters, pliers (two pairs are handy but one will do the job), round-nose pliers (optional - see note above). - some sore of a dowel to use to smoothly bend wire. I've used a stainless-steel drinking straw. - one spare 8 or 9mm bead, used for measuring. Optional, but very handy. A little trick to know how long to cut a beading wire is to thread a 8 or 9 mm bead on you wire, in addition to whatever you are beading. Then cut the wire. When you remove the "measuring bead" you're left with a length of wire that is just right for forming perfectly sized loops. That's much easier than trying to measure with a ruler. - String one small bead, a big bead, another small bead onto a headpin. 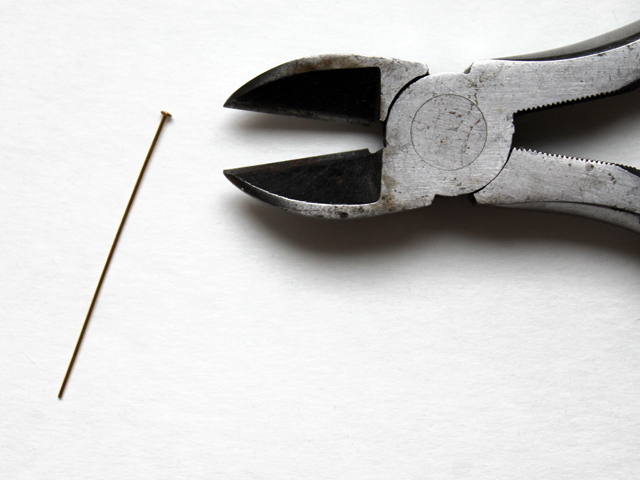 Add your "measuring bead" and cut the pin. - Form a loop using round-nose pliers if you have them. If not, form the roundest loop you can with regular needle-nose pliers. (Here's a quick Youtube showing how this is done). 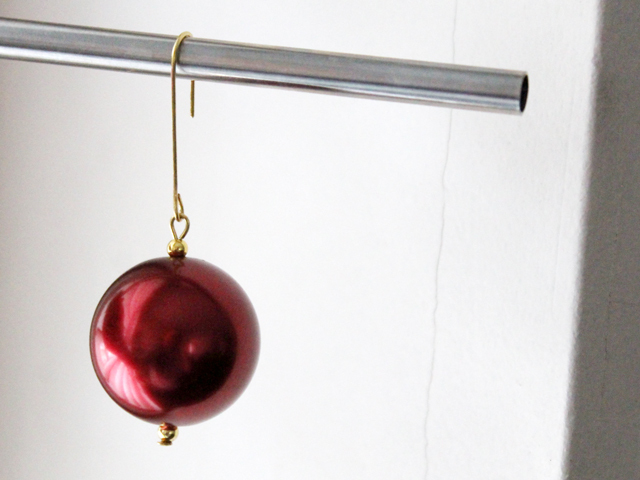 - Cut the head off a second headpin and form a loop at one end. 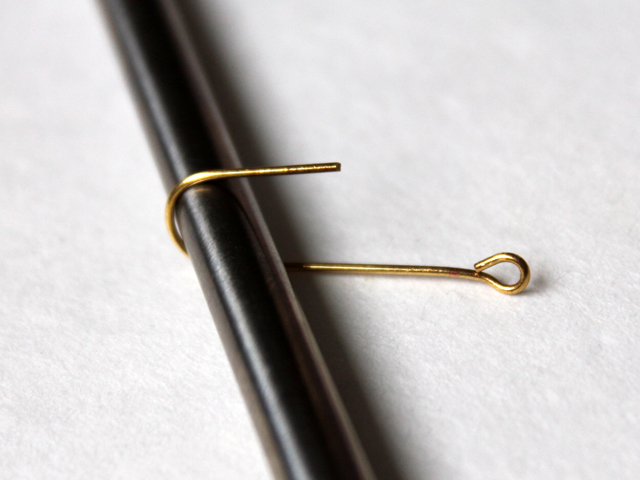 - Bend the wire over your dowel, to form a hook. 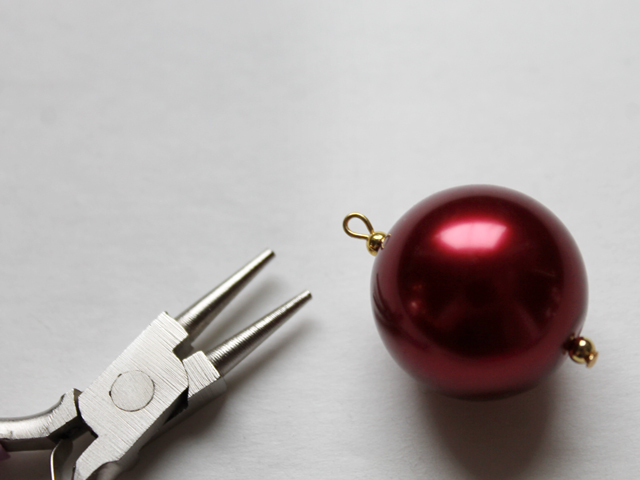 - Using your pliers, open one loop (by bending the wire to the side, not spreading open the loop. See this video to see what I'm trying to say.) Put through the other loop, and close. ↑ Haha, I see that this scene doesn't make our home appear to be very cozy! 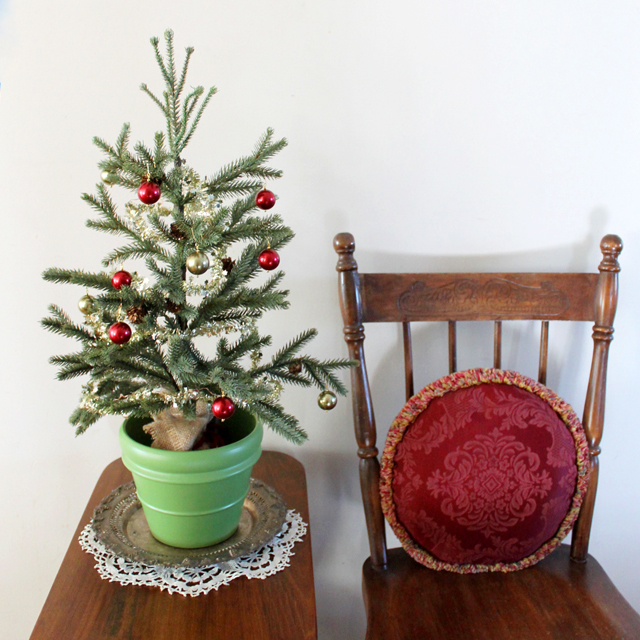 In reality, this tree, lit with a string of battery powered lights, is now sitting on a cabinet in the living room. Thank you for the note, Bryonna! I’m so glad you like them. What a clever idea, and they look so pretty!! Lovely idea,Thank you, Love the bead store. can not find any store like that in the UK. 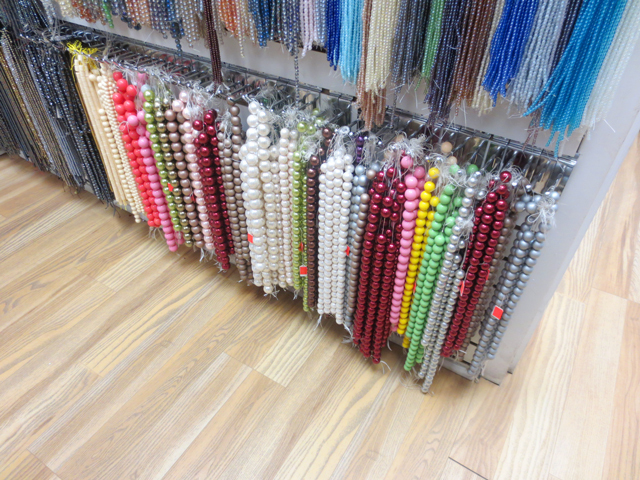 Yes, we are very lucky here, having such great bead stores!